Introducing Women’s Hockey Life’s newest brand ambassador: Jessica Pumphrey! My name is Jessica Pumphrey. I am originally from Ottawa, Ontario, Canada, but I’ve lived in Whitehorse, Yukon Territory, Canada for the last decade. I started playing hockey the year after my brother started because I was too young to be left alone at home (six yrs old) and hated sitting in the cold stands alone with no one to play with, waiting for him to get off the ice. So I decided if I had to be up at 5:30am regardless, I might as well be on the ice having fun too! 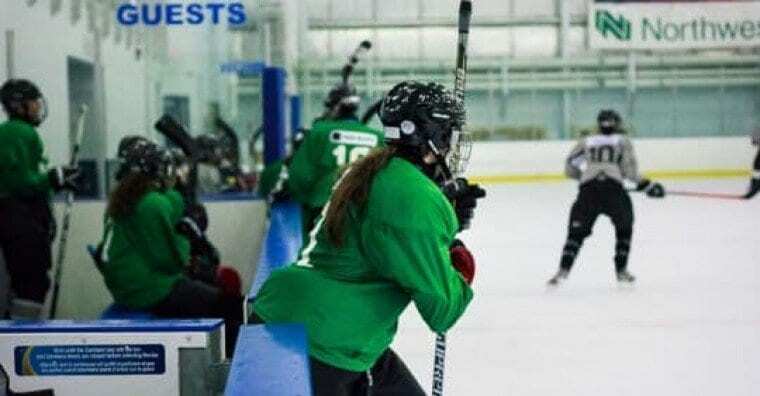 I played boy’s house league for several years before being approached by the coaching staff of a girl’s competitive team in Nepean, Ontario to come try out. I then played competitive girl’s hockey throughout high school. I received an offer from Hockey Canada to try out for the U18 women’s team, however I was away on a family vacation and missed the window to respond! I then attended university and stopped playing hockey for several years. I realized once I moved to Whitehorse that hockey was something I had defined myself by, and the lack of it in my life was causing me depression and anxiety. If I wasn’t a hockey player any more, who was I? I wasn’t sure, and the lack of direction in my life was turning me in to a person I did not like. I signed up for the women’s rec league (shoutout to Whitehorse Women’s Hockey Association), got back on the ice, made new friends and have been lucky enough to play with my mother for the last few seasons! (Get out of the way, mom!!) I regained a sense of control of my life, was empowered to try new things, like coaching, because of the confidence and support that hockey and the community gave me. I intend to keep playing and being involved as long as I can! I decided to throw my hat in the ring to be an Ambassador because of how much the sport has given to me. I love motivating women and girls to move out of their comfort zones, try something new and meet new friends. I truly enjoy that lightbulb moment when someone realizes they are capable of doing something they thought they weren’t, and I love bringing people into the hockey family. Before hockey politics, before competitiveness, there is the pure joy of the game and the fast friendships that form when you become a teammate. I want that joy and sense of community for every woman because it is so important for women to realize they are capable, brave, and supported! I am really looking forward to networking with everyone, to hopefully meeting some people along the way at tournaments, etc and making new friends! I am also looking forward to encouraging women to try the sport, to help grow it beyond its traditional North American roots and getting women from all over the world interested and playing the sport! I love Canada, and always want them to win (wink wink! ), but also love the game and want it to be healthy and vibrant every where. Better competition means the sport as a whole gets better and I want to see that. I am a bibliophile. I have books on almost every surface of my house because I have run out of shelving space on my six bookshelves. I love to read and work in a library. Most people have a hard time wrapping their minds around that as I am naturally a loud and energetic person, however I am perfectly content to sit and read for hours at a time in silence too. Meaghan Mikkelsen – I have a huge “girl crush” on her. I love her playing style! She was amazing in the last Olympics. I think not only is that applicable to hockey and sports, but also to life. Regardless of what inherent talent or advantage someone is given, if they don’t work to develop it, they can still get pushed out by someone willing to do the work. So keep going, keep fighting for your dreams, because it isn’t over until the last whistle goes! I would love to see the game develop in more countries so that the competition at international events becomes a bit better. Canada, USA, Sweden, Finland, have started to even out somewhat as the programs develop and it is no longer a two-horse race all the time. However, it would be wonderful to see places like Germany, China, Slovakia, etc. start developing programs to compete at the higher levels. I would also love to see women’s hockey treated as equals for pay, advertising, screen time on air, etc. The women competing at the NHL Skills Competition showed that they have just as much talent as the men. They deserve a wider audience to showcase it. Hopefully we will see that more and more over the next few years.